Unless something unexpected comes up (which when modding for any game could very well happen) this should be the final version of my randomizer mod. 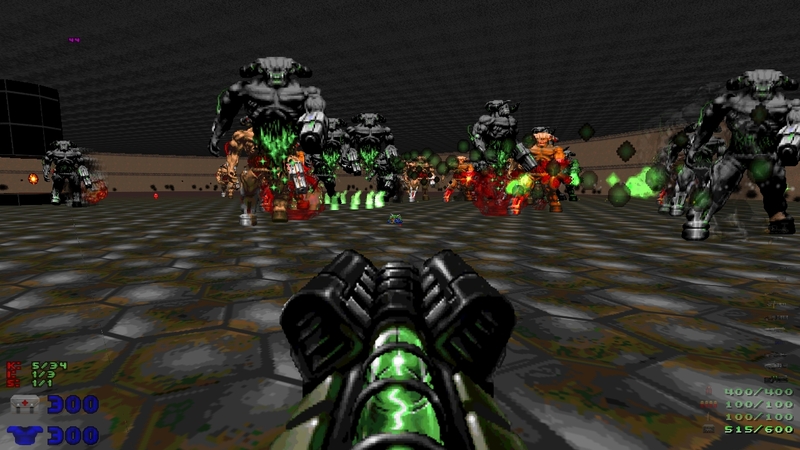 Herculine's Doom Upgrade is a mod for GZDoom that uses custom spawners to randomize monsters and items. Many new ones are added and have been carefully selected and placed to present new and unexpected challenges while attempting to maintain a semblance of the original difficulty intended by any given map's author as well as to maintain the original atmosphere of the games. New weapons have also been added in an attempt to maintain these balances but also have been chosen to fit the original atmosphere. 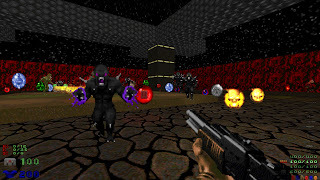 As a result of randomizing monster and item spawns, difficulty can potentially be erratic. Overall difficulty is usually slightly higher. If you're having too tough a time of it, you can try restarting the level to get a different set of random spawns. This mod likely will not work with any mod that replaces the existing monsters, weapons or items. This mod will work with any Doom IWAD and should work with most custom megaWADs and levels, but may not work with heavily scripted ones. The various contributors to Realm667's Beastiary, Armory, Item Store and Prop Stop. This mod is in no way an attempt to take credit for anyone else's excellent work. A full list of credits can be found in texts both included separately with this WAD and also imbedded in the WAD itself. Snarboo for his randomizer which inspired me and taught me how to do this. Aubrey Hodges for the best Doom music ever. Elbryan42 and DoomDepot for the music WAD. All my blog readers who have helped with testing and shown encouragement and support. Everyone responsible for creating GZDoom and keeping it up to date. I'm not trying to hide from DoomWorld here. I've tried virtually all day to upload this to the Archives with FileZilla and have repeatedly failed. I even tried to e-mail the file directly to Ty Halderman himself but apparently that is not allowed either. 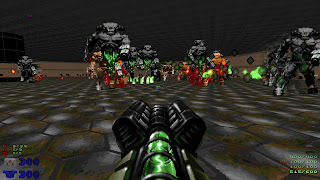 Later I'll make posts in both the DoomWorld Forums and the DRD / GZDoom Forums to give the mod wider exposure to the Doom community and all my fans therein. I hope this mod is enjoyed by many. Please come back and let me know what you think of it. Almost immediately after making this post and posting links in the above-mentioned forums I was playing through a map and noticed a minor bug or two that I'd missed. The sawed-off appears to be missing its pick-up sound effect and the armor shards don't seem to be working quite right. That's not really so minor, but I should be able to fix it. Apparently I also need to tweak the health bonus pickups. Currently if you have 300 health and touch one, it will knock you back down to 200. I should be able to fix this as well, but it's currently taking a bit of experimentation. LOL: the Cyberdemons are on "Bad Dream" from the Master Levels. I think I've just about got the kinks worked out of the faulty armor shards and stim bonuses, but I'm not going to upload another version until I'm certain there's nothing else I've missed; it will probably be a day or two. Being able to automatically pick up the Spheres is a waste of resourses if you already happen to be maxxed out in armour or health, or even at 150 or so. Otherwise, its only good for trying to hit 100% on items at the end of the level. More ammo is always a good idea. Maybe you could make a new backpack that works like a "Bag of Holding" or has borowed some technology from Doctor Who's TARDIS ;) Either a magic or technological device would work in the existing framework of the game. A backpack that's dimensionally transcendental like the TARDIS would be nice, but I don't want the carry capacity to be unlimited; I'm still trying to keep things somewhat balanced. I wasnt' thinking on having a container that was unlimited in capacity, I was more thinking of the extra capacity being explained by similar technology. Slightly bigger inside than outside, yes. Able to have a Cyber-demon dance party inside, not so much. Where did you get all the sprites for the custom enemies?